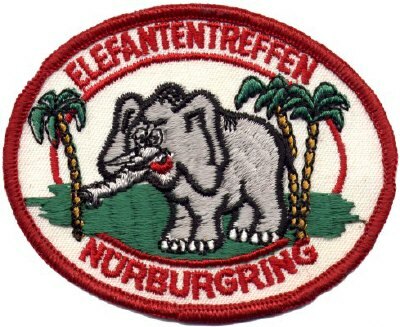 Vintage 1970's Elefantentreffen Nürburgring sew-on patch. It shows an elephant amidst palm treen and the script "Elefantentreffen Nurburgring". It measures approximately 9.5 cm (3.7 inches) in width and 7.5 (3 inches) in height.